New York Yacht Club American Magic, the U.S. Challenger for sailing's 36th America's Cup, set to be held in 2021, today announced aerospace pioneer Airbus as its innovation partner. As Official Innovation Partner, Airbus will allocate engineering resources and modeling expertise to assist in the design optimization of American Magic's future AC75 racing boat– a brand new, cutting-edge, high-tech craft aiming to compete in sailing's oldest and most coveted trophy. Airbus will provide engineering support in areas such as simulation capabilities development, systems architecture design and testing, hydrodynamic calculation and optimization, boat control and instrumentation. "This is a true challenge for the team to see how they can optimize technological innovation under tight time and resource constraints," said Jean Brice Dumont, Executive Vice President Engineering at Airbus. "We love good, clean competition. That's what pushes us to continually improve at innovating, solve challenges, learn from experience and, ultimately, win. Our goal in this project is to help American Magic design the fastest possible flying yacht for 2021." Dumont noted that Airbus' engineering know-how was also sought out by the U.S. Defender in previous America's Cup (2014-2017). Resulting concrete benefits for Airbus have included improved wing tip design for the A350 and new instrumentation now currently used on all aircraft development. Sailing and aerospace have multiple shared technologies. Optimizing design, engineering, and data capture, analysis and simulation are among the parallel priorities of both the Airbus and American Magic teams. Wings produce lift while sails generate thrust, but both cut through the air in a similar way. When the hull of American Magic lifts out of the water, aerodynamics become crucial to speed and stability as they "fly" across the water on foils shaped like the wings of Airbus aircraft. 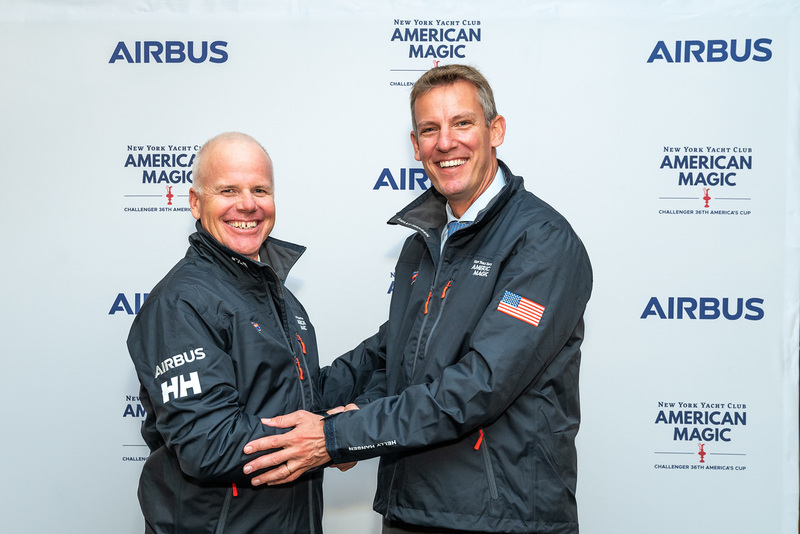 "It was important to have an Innovation Partner with past America's Cup experience," said Terry Hutchinson, Skipper and Executive Director of New York Yacht Club American Magic. "Airbus' expertise and personnel will be critical to a Cup-winning design team. This engineering partnership has been active for the better part of 2018 and is nothing short of awesome. Together we will push sailing technology forward, win the biggest prize in the sport, and inspire sailors here at home and around the world." This innovation partnership reflects Airbus' significant and growing presence in North America. With major design, engineering and manufacturing facilities in both the United States and Canada, Airbus is a natural fit for the American Magic team. The Airbus team in North America is ready to see the America's Cup return to its historic home in the U.S.